It’s such a simple idea: Marry relatively affordable DDR memory cache with a hard drive in order to speed write performance. It’s been done for years on controller cards, but credit Buffalo Technology for taking advantage of cheap memory prices and leveraging the concept with an external drive. The company’s DriveStation DDR—a 3.5-inch, USB 3.0 drive—easily surpasses the write performance of any external hard drive we’ve tested. Indeed, it rivals the speed of external USB 3.0 solid-state drives, and at a far lower cost per gigabyte. This isn’t the cheapest external 3.5-inch hard drive on the market, but it’s one of the fastest at writing we’ve ever seen. External hard drives are relatively simple devices. The DriveStation DDR is an approximately 8-by-5-by-1.75-inch black box sporting a tick of red on the top front. Inside are a USB 3.0 type B port, a Kensington lock port, an AC jack, power and activity lights, and a cooling vent on the back. There’s no actual fan, as Buffalo feels that passive convection cooling is sufficient. And that seemed to be the case during our subjective and official tests. With both volatile memory and a hard drive on board, however, it’s no surprise that AC power is required to operate the drive. The one drawback to using DDR memory for caching is that Buffalo’s DriveStation DDR requires an AC power supply. The 1GB of DDR3 cache onboard helped the DriveStation DDR’s write performance tremendously. It wrote our 10GB mix of files and folders at 140.8 megabytes per second (MBps)—that’s at least 40 MBps faster than the next fastest external USB hard drive we’ve tested. Nice. But where the DriveStation DDR really showed its mettle was in writing our large 10GB file at a scintillating 201.8 MBps, nearly twice what the average USB 3.0 hard drive can manage. 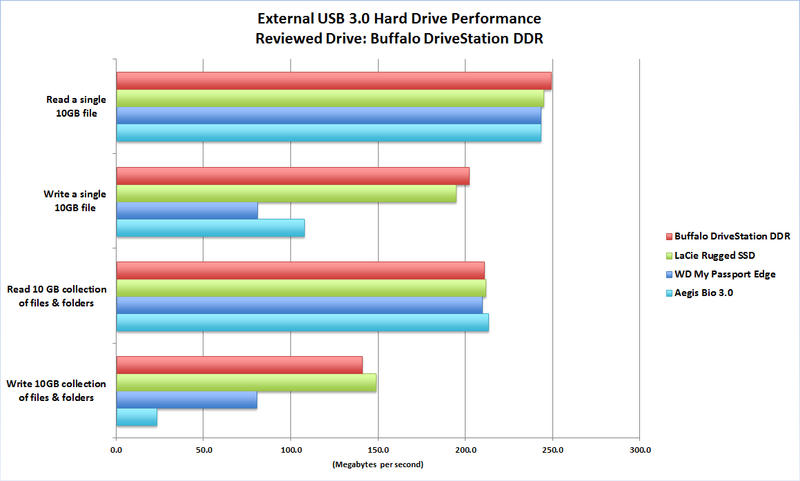 The DriveStation also performs on a par with most of the USB 3.0 SSDs we’ve tested. It read the file and folder mix at 210.8 MBps and the large file at 248.9 MBps. Each of those scores is much closer to what you’d typically get with a USB 3.0 hard drive. Don’t expect these numbers in everyday usage, however, as our tests write to and read from a RAM drive in order to avoid the presence of any bottlenecks in our test platform. With street prices of $140 and $200 for the 2TB and 3TB versions of the DriveStation DDR, respectively, these aren’t the cheapest external 3.5-inch hard drives on the market, but they are the fastest we’ve seen by a long shot. And compared to the external SSDs whose performance they equal, they’re dirt cheap.